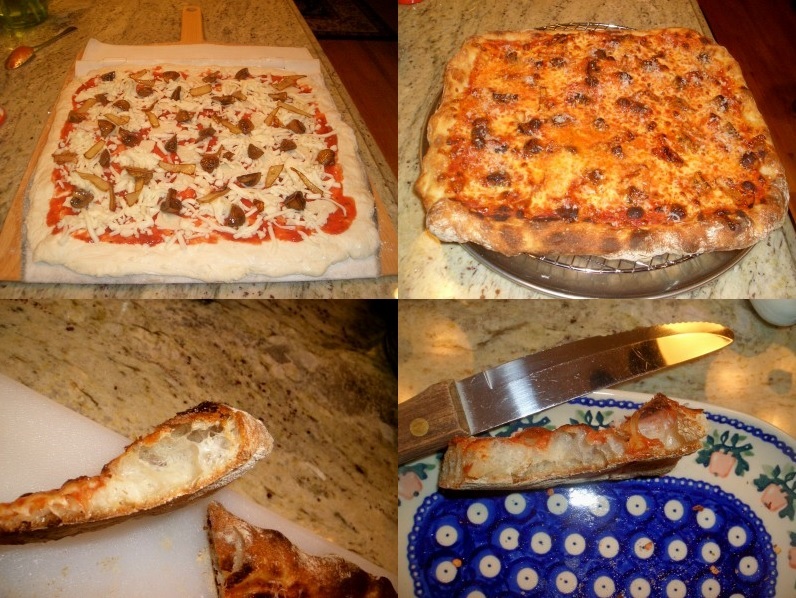 Rustic Ciabatta Pizza - Pushing the Super Peel Envelope with Some Really Wet Dough! - Super Peel: Moving Dough Just Got Easier! Using a wetter dough for your pizza making can produce an amazingly airy and crispy crust. Here are a few pictures of a pizza I found where the baker was using 90+% hydration – basically a ciabatta dough pizza! While you don’t need to go this far, it does look interesting. One note of caution…….Your Super Peel can handle very wet dough, but the amount of flour/cornmeal/bran/etc. used beneath your pizza or loaf will have to increase with increasing hydration level and the longer you wish to leave your pizza/bread on the peel. This is one reason that I prefer to lift the bread/pizza right before and when it is ready to go into the oven. I have also found that with verywet dough that is rolled out very thin, there can be a tendency for the dough to “cling” (different than stick) to the cloth. This seems to be due to a combination of the very soft nature of such dough and the very low mass of the thin dough sheet. Many things are possible, but it is always best to be a little conservative at first and to experiment a bit when you are pushing the envelope. Stay tuned for news from the Pizza Expo! !